Model: The locomotive has a digital decoder and a special can motor. 1 axle powered. Traction tires. The locomotive has coupler hooks. 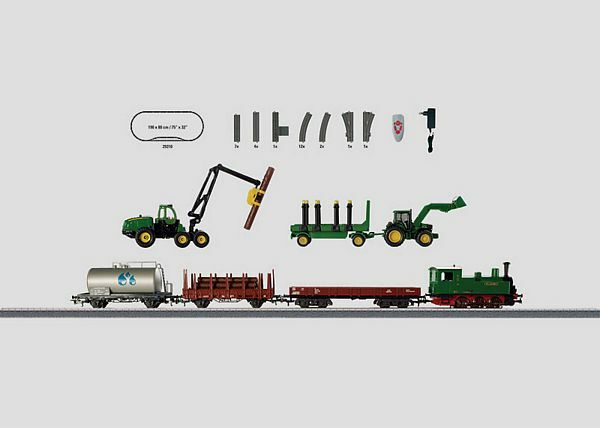 A sturdy model of a tractor with a trailer, and a harvester with a grabbing arm, manufactured mostly of metal, are included. Also included are logs made of plastic. All of the cars have Relex couplers. Train length 49.8 cm / 19-5/8". Contents: 12 no. 24130 curved track, 4 no. 24188 straight track, 1 base station, 7 no. 24172 straight track, 2 no. 24224 curved track, 1 no. 24612 right turnout, and 1 no. 24611 left turnout. 1 each 230 volt / 18 VA switched mode power pack, and a wireless infrared controller. This set can be expanded with the C Track extension sets and with the entire C Track program. The 74492 electric turnout mechanism can be installed on the turnouts. Sturdy train and forestry equipment  just right for children aged 6 and above. All kinds of play fun revolving around the theme of forestry. C Track layout that can be expanded easily. The 44310 car set and the 78310 theme track extension set are the ideal add-ons for this starter set.